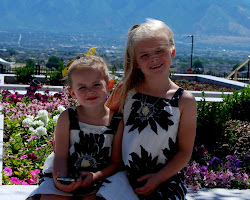 We've been wanting to experience some of the great Lehi local flare. So, when Scott's parents and his sister told us they were going to Charlie's on main for BBQ, we we happy to join them. We got there before them, and it was really yummy. It was more expensive than we are used to spending on a lunch, but the girls did a great job of eating the sandwiches. The coleslaw wasn't Kentucky Fried Chicken's coleslaw, but it was great on the pulled pork sandwich. I only had a film camera with me, so I didn't take a bunch of pictures. So here are the few to document the day. fun pics. i need to get mine developed.